And now for something completely different - not a flower in sight!! I've made a bookmark using the Tonic Studios Border System and Double Scallop punch on some card from Papermill Direct. 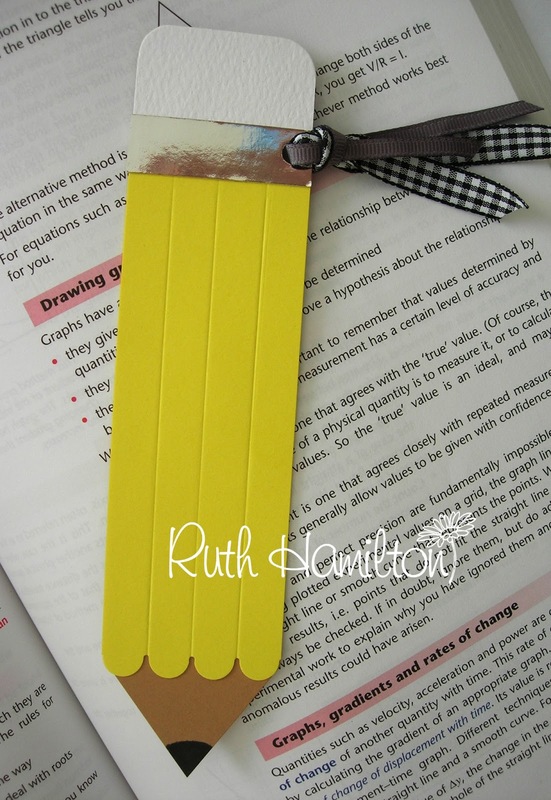 Yellow card, kraft card, white card, silver card, grey marker, ribbon. Border system, double scallop punch, scorer, corner rounder,double sided tape. 1.Using the scallop punch and border system punch twice to give 4 scallops. 2. Cut a 19cm x 4.5cm rectangle of kraft cardstock , mark onne end at 2.25cm in the centre and 3cm from the bottom on each side. Cut off from the centre point to the marks on the sides to create a point - then colour the point with a grey Promarker to resemble a pencil lead. 3. Trim the yellow cardstock to 12.5cm from the scallops and trim both sides. Scores from between the scallops to the top of the yellow card. 4. Cut a white rectangle measuring 4.5 cm x 3.5 cm and attach to the top of the pencil with DST. Cover the join with a 1.25 cm x 4 cm strip of silver card. Then round the corners of the "rubber" with a Duo Corner Rounder.